New! The 'Fetish' series! Leather, clasps, rivets and more on stylish artsy cowls. Each one is one of a kind. Be Styish. Be Warm. I purchase artistic yarns from all over the world so you have a unique blend. 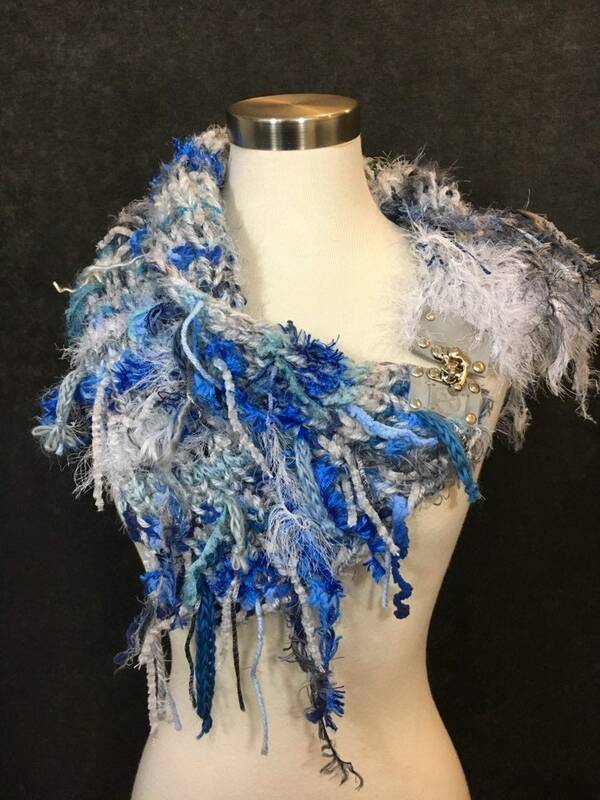 I create my own patterns and yarn blends, so you have a unique piece! This piece incorporates a grey leather embellishment with purse clasp closure (functional) for extra styling with rivets. Open it to put it on or pop it over your head. 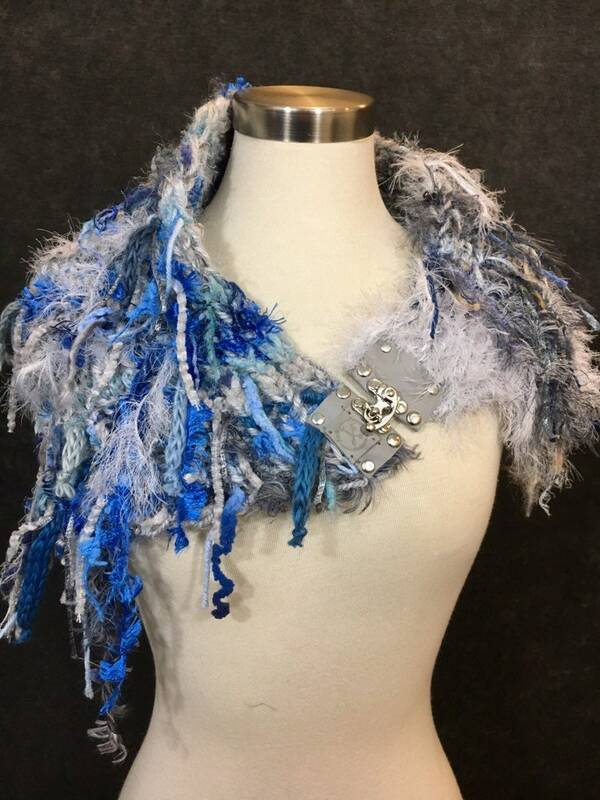 This is a gorgeous, high-fashion yet casual one of a kind knit shaggy mini-poncho, cowl style or shoulder wrap. Add it as a high fashion collar to any simple shirt or sweater. 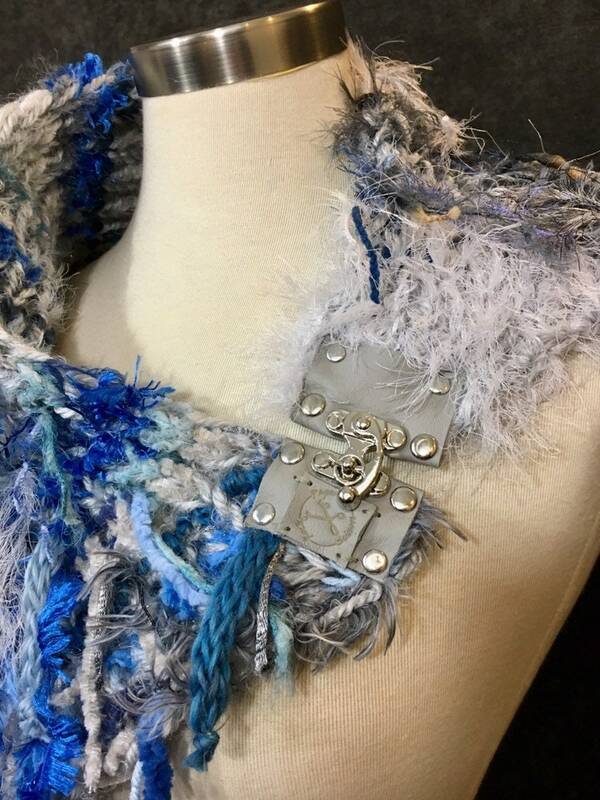 The clasp adds a unique couture detail. A blend of blue and grey hues - perfect with jeans and any simple top, great over jean jackets and more. The base yarn is a fluffy pale grey acrylic nylon blend, with one end finished in pale grey fluffy faux fur. I blend in unique and artistic yarns like hand dyed satin and cotton, chenille, acrylics and novelty fibers. *These are great ponchos on kids too! Perfect photo props. Just pop it over your head, twist and style as desired. Simple and easy way to dress up any solid colored top or jacket. Open the clasp to avoid messing up your hair style. I blend the base yarn with my own custom hand tied art yarn blends so you have a unique piece. 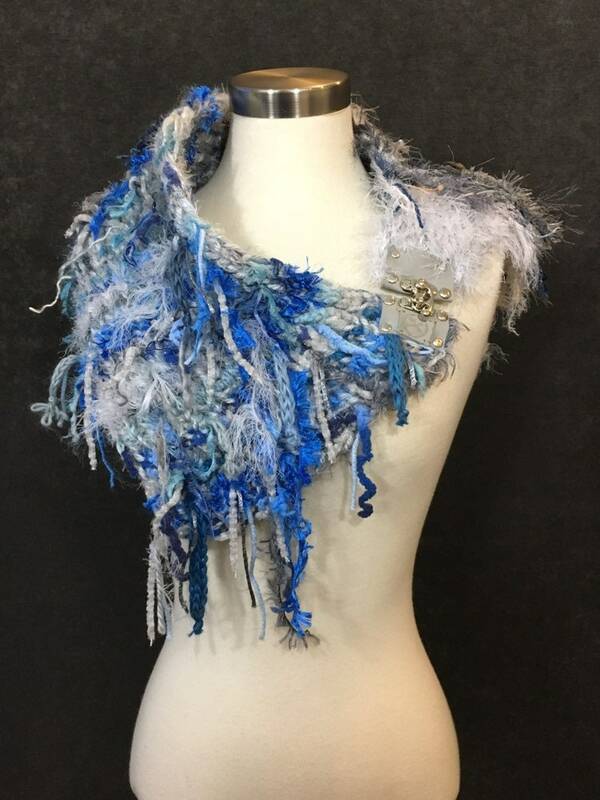 This piece has a great shape and is plush yet flexible and lays nicely around your neck. I create my own hand tied skeins so the fringe is integral to the piece, not added afterwards. Twist it on your shoulders to see which style works best for your outfit and figure. Spice up your fall and winter wardrobe - in style! 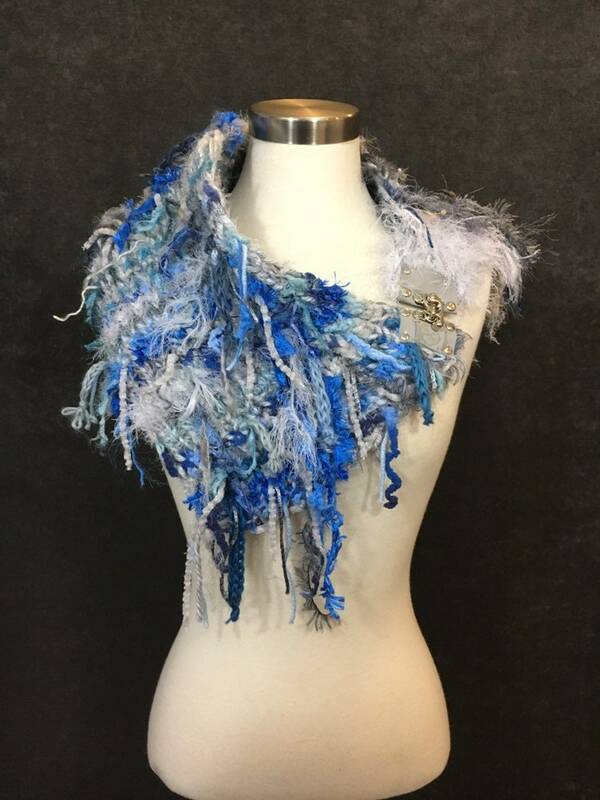 If you're not in to the long scarves and longer style pieces, but still want the unique fashion style of a shaggy, over-textured piece - this is it! This piece lays nicely and retains its shape. I make my own custom yarn blends with materials gathered up all over the world. 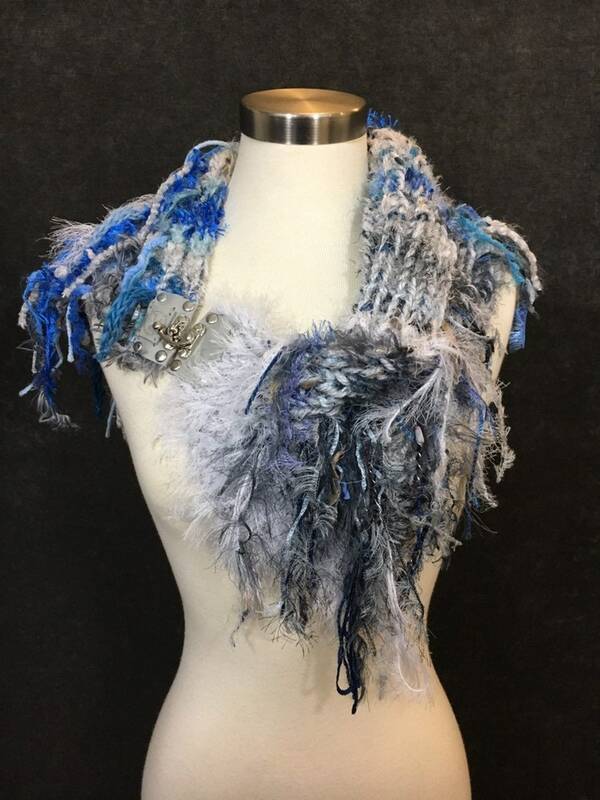 This piece combines all of those textures in a great, fun, fringed cowl!! 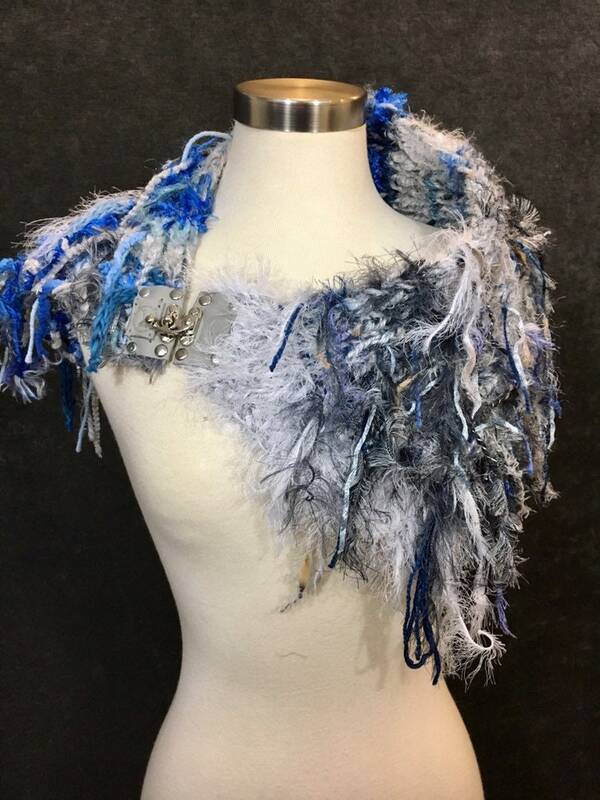 It's a collection of over 18 different materials, hand tied and knit together. Warm but flexible, warm yet stylish! Materials include woven ladder ribbon, chenille, nylon, rayon, acrylic, hand-dyed ribbons, flag, short and long eyelash and more! Follow along to see what's new and where I'll be! And search by name on Instagram, Pinterest and Wanelo too!